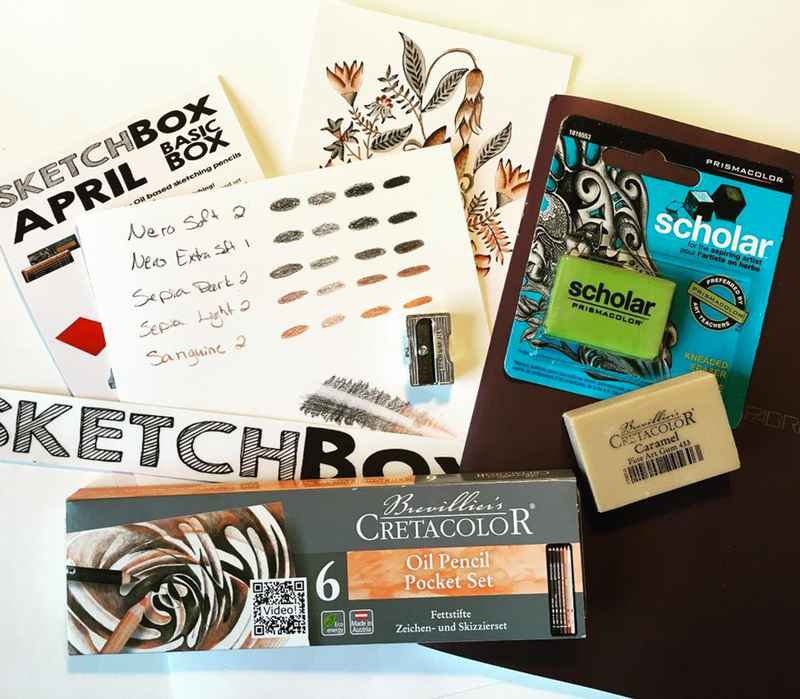 April 2017 was all about tinted sketching! First up we included a six pencil set of oil sketching pencils from Cretacolor. One of our favorite sketching sets, this oil based set is great to quickly get down ideas on paper. It’s small size allows for easy travel and the range of colors allows you to express more than traditional graphite. It includes Nero black soft and x-soft, White, Sanguine, Sepia Light and Dark. Next up we included an ecoQua sketchbook. Made in Italy by Fabriano, these versatile notebooks contain multiple sheets of FSC-certified, chlorine-free, acid-free paper that is completely recyclable. Perfect for sketching, it makes a great addtion to this month’s box. Next up we included a KUM Magnesium sharpener. It's a rectangular, single-hole magnesium-alloy sharpener with dynamic torsion action tempered steel blade. It's one of our favorite small sharpeners for those on the go. We also included a Prismacolor Scholar kneaded eraser. This pliable eraser can be molded and shaped to erase tiny specks or large areas. Excellent for highlighting and erasing precise areas. Just knead the eraser to clean it. Finally we included an excellent companion for artists who use dry media. The Cretacolor Caramel Fine Art Gum Eraser erases cleanly, leaving absolutely no marks behind. This picture was taken by our talented subscriber @afritz55 on instagram.